When we were in Tororo, I met James who works as a HIV counselor at CDC Uganda. 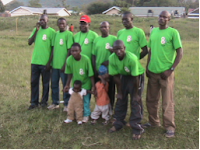 On the side, he is training two boys out to run track & field in preparation for the Beijing Olympics. These two athletes, Stephen Odwar and Samuel Egadu, recently competed in the All-Africa Games in Algiers. James recently contacted me to see if it's possible to get bungee ropes (new or secondhand) for conditioning. I'm not sure what type is necessary or where I can find these bungee ropes for purchase. Can anyone offer some helpful advice? Point me in the right direction, please.